Sometime you need to move a large number of VMs, or you need to recover from a broken hyper-v host, or similar. 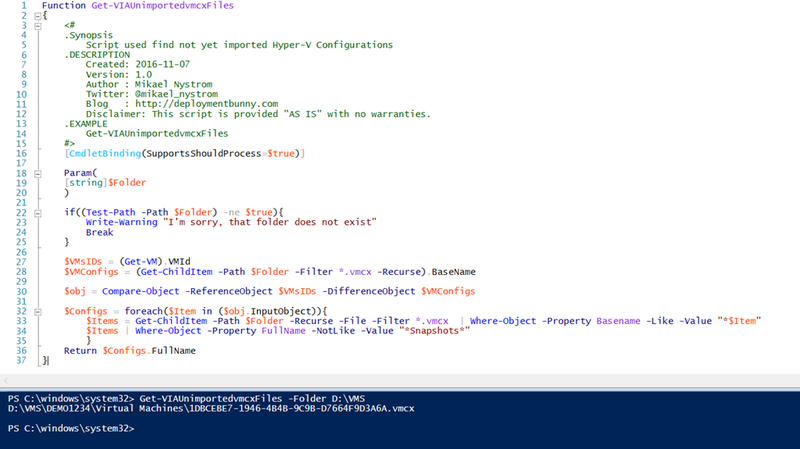 If you have a few VM’s, that will be easy, but if you have many you will most likely use PowerShell to import the VM’s. That works perfectly fine, but you have a few VM’s that did weren’t imported correctly you will end in a state when you ask your self –Which VM’s are imported and which ones are not? Disclaimer: This script is provided "AS IS" with no warranties. Write-Warning "I'm sorry, that folder does not exist"
$Items = Get-ChildItem -Path $Folder -Recurse -File -Filter *.vmcx  | Where-Object -Property Basename -Like -Value "*$Item"
$Items | Where-Object -Property FullName -NotLike -Value "*Snapshots*"